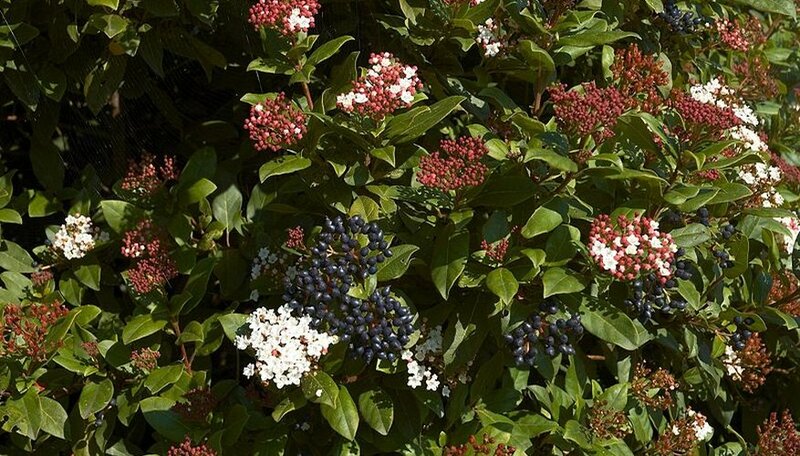 Viburnum tinus is a semi-evergreen perennial flowering shrub that throws white and very pale pink blooms in spring followed by bluish black fruits. It is grown as an ornamental, often for hedging, foundation plantings and in borders. Viburnum tinus is an extremely low maintenance shrub that is hardy in USDA zones 5 through 8, thrives in a range of light exposures and prefers a moist, slightly acidic to neutral soil. Schedule all the pruning of your viburnum tinus to occur immediately after the seasonal bloom subsides in the late spring or early summer. Waiting to prune any later in the fall or during the winter dormancy period would have you pruning off the buds for the next spring's bloom. This would severely diminish both the next season's flowering and fruiting' which is not necessary (or recommended). Maintenance-prune your viburnum each year to remove any damaged or diseased branches and foliage. While viburnum tinus does not require pruning, you can trim branches to manage the shape and size of your shrub. Cutting away suckers will keep the shrub from spreading out in width. Encourage new growth in a hollowed out or browning center of the shrub by pruning away older branching and allowing better light penetration into the center of the plant. Hard prune your viburnum with aggressive cut back when you need to restructure the shape of the shrub or correct its interior branching architecture. Hard pruning becomes necessary when shrubs become badly overgrown, damaged or otherwise misshapen. Remove up to one-third of the shrub's main branching with long handled loppers that can easily reach into and over the shrub. Identify and cut any primary branches down to the main trunk outside of the branch collar. Proceed to identify and make cuts on the secondary branching. Next, pull each severed branch from the shrub as you make a cut to assess the structure before making the next cut. This pause between cuts will ensure a visually pleasing result once the shrub recovers and leafs out again. Hard pruning should only be required once every 5 to 10 years.